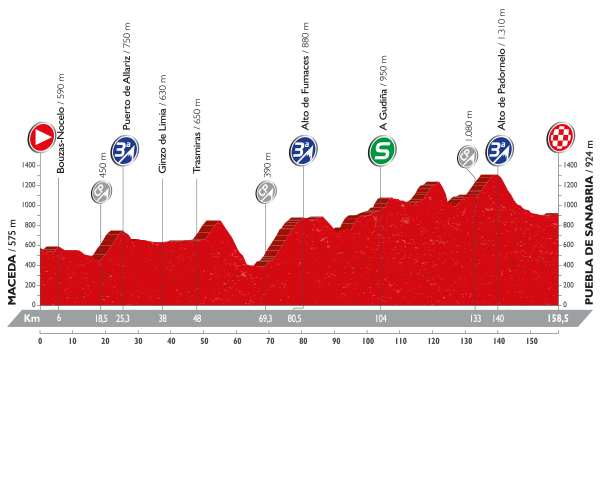 The task on Stage 7 of this year’s La Vuelta a España is a 158.5km trek from Maceda to Puebla de Sanabria, a tough day to control which offers very little in the way of flat terrain from start to finish. This short affair should prove to be another aggressive day in the saddle which sees many team’s eager to get a rider in the breakaway. A triumvirate of Category 3 ascents shall await the peloton en route to Stage 7’s finish, softening the legs ahead of a manic final 20km which appear poised to crown the winner of today. Once again at La Vuelta a España, it shall be difficult to choose whether to back the chances of the breakaway or an elite bunch kick, but a handful of names do stand clear of the rest. Fabio Felline was able to place on the podium once again at this year’s race and will be wondering what exactly he needs to do in order to walk away with a stage win from this opening week. The Trek-Segafredo rider appears to be in fantastic condition right now and there should be a good chance of him matching the strongest in today’s final 20km, before then outsprinting them at the finish. Alejandro Valverde once again appears to be the most well-suited rider in the peloton in order to contest the finish of Stage 7. The Spanish veteran has support in the way of José Joaquín Rojas and Daniel Moreno and shall subsequently feel confident of possessing a strong leadout in the decisive finale of today’s stage. The attritional nature of Stage 7 should play into his hands and there is a strong chance that Movistar will be looking to set him up for the stage finish once they crest the final summit. Samuel Sanchez will surely be eager to seize upon what appears to be some fantastic form in the twilight of his career. BMC worked hard on Stage 6 and are clearly interested in picking up a stage win while defending the red jersey of team leader Darwin Atapuma. Normally this would be a golden opportunity for Sanchez to make the day’s move and then push onwards to a stage victory via a reduced bunch kick. However, his recent performances have now forced him further up the general classification and could subsequently find himself closely tethered to the peloton. Philippe Gilbert could prove the ideal alternative for BMC in the case of Sanchez finding his efforts stifled on Stage 7. The former world champion and Belgian hero has a strong chance of featuring here on paper, but his performances so far at La Vuelta a España have done little to suggest he will really threaten those already in good form. Tosh van der Sande is riding himself into some good form and could well challenge for the win here, though a slight uphill drag to the line may make it difficult to outperform the likes of those mentioned above who are bound to find the terrain more preferable. Others well worth keeping an eye upon during the day are; Simon Clarke, Kristian Sbaragli and Nikias Arndt. Posted on August 26, 2016 August 26, 2016 by Spokenforks	This entry was posted in La Vuelta a España 2016, News and tagged Alejandro Valverde, Fabio Felline, Kristian Sbaragli, La Vuelta a España Stage 7 Preview 2016, Maceda, Nikias Arndt, Philippe Gilbert, Puebla de Sanabria, Samuel Sanchez, Simon Clarke, Tosh Van Der Sande. Bookmark the permalink.